More and more people are using mobile phones to access the internet. Internet access with mobile devices is huge and growing rapidly! In fact, there has been a 400% growth in mobile searches over the past year. Accessing the internet with a mobile phone is extremely convenient. The problem is that the screen size is small and many websites are useless on a mobile phone because they do not display and/or function properly. The best solution to this problem is to have a mobile version of your website. 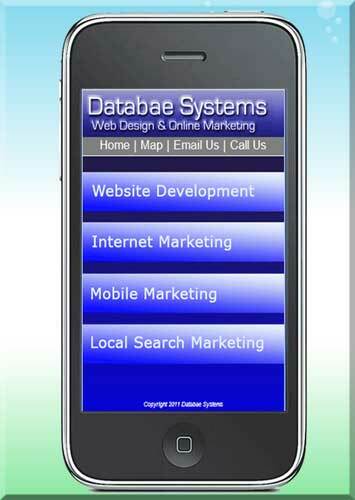 Databae Systems can build a fully functional, effective, easy to read mobile version of your website that will automatically appear on mobile devices when your regular website is visited. Visitors using a mobile device will not stay on your website if it is hard to read and does not function properly. With the dramatic increase of internet access with mobile devices a mobile version of your website is a necessity if you want to attract customers online! Not having a mobile version of your website gives your competitor a huge advantage. The only way to get indexed in mobile search engines is to have a mobile website build with proper code, settings and functionality. Mobile websites are very affordable to have build! Benefits: Attract and keep more visitors on your website. People using mobile phones are 7 times more likely to purchase than those using a Laptop or PC.